At Welltodo, we’re passionate about helping people build incredible businesses and careers in the wellness industry. Whether that’s by providing the latest news and insights impacting and influencing the industry, through insightful events with leading brands and industry professionals, or by supporting businesses to find passionate, high calibre talent, whilst also helping individuals build fulfilling careers. Now, as part of that mission, we’re excited to announce the launch of Welltodo Careers — a revolutionary new careers service which is set to become one of the most important grassroots growth drivers in the wellness industry. Launching today, Welltodo Careers is a brand new platform offering unique talent recruitment and job advertising services, online careers courses, specialist events and insightful editorial content. 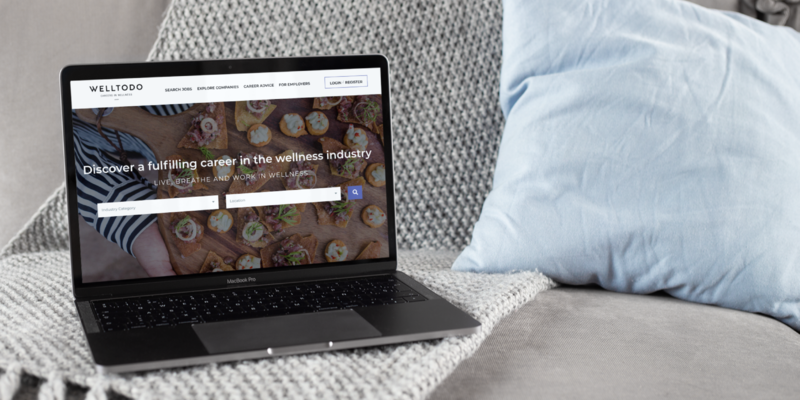 Welltodo Careers has been created for both wellness brands looking to recruit top talent, and candidates seeking to play a part in shaping the industry. It also comes at a time when growth of the global wellness economy continues to pick up speed. As the market experiences an unprecedented level of growth, new product launches, technological innovations, mergers and further investment, this all but adds to the astounding upward trajectory but importantly, the need for the companies operating within it to hire the right people to grow and thrive. This is something we are incredibly excited and passionate about. Our goal is to empower the growing number of people who are eager to contribute to the growth of the sector as industry professionals. With the wellness industry currently valued at a staggering $4.2 trillion worldwide (GWI) and showing little sign of slowing, many businesses have struggled to secure suitable talent to grow their brands and professionalise the industry further. We have launched Welltodo Careers as a solution to this talent gap. Through our work, we’ve found that one of the biggest barriers to entry for those seeking/recruiting for careers in the wellness industry is the lack of understanding available opportunities and a misconception that to join the industry you must look a certain way or fit the mould of a certain ‘type’ of person. Paired with the misunderstanding that sideways moves are not possible or that you must start at the bottom, it has meant the wellness industry has suffered in the recruitment of adequate talent to keep up with demands for growth. But this doesn’t need to be the case. We know that the industry needs experienced professionals with wide-ranging expertise to infiltrate it, bring credibility and professionalism and help drive the market forwards. Candidates, on the other hand, need an education platform which shines a spotlight on how and where to gain entry. We have endeavoured to build a solution which addresses this head on, and that can also evolve with its audience. By challenging the traditional recruitment model – getting rid of hefty placement fees and lengthy interview processes – Welltodo Careers brings a totally unique hiring experience to the wellness industry. A platform where leading businesses such as existing clients Peloton, Form Nutrition, Rebel Kitchen and MINDBODY have a space to share their incredible brand stories, have unlimited job listing capabilities and interact directly with candidates, Welltodo Careers also acts as a discovery tool for candidates, helping them learn about who the best brands in the business are without having to shop-around and ‘learn the hard way’. “There’s been a gap in the market for someone to provide a solution that makes it easier for wellness businesses to find talent that will help push the industry to the next level,” commented Adam Thompson, CEO of Rebel Kitchen. It’s always been our belief that together we can propel the industry forward and impact a greater number of lives with wellness products and services. We hope this new innovation will accelerate that vision, and we’re excited for you to join us on the journey. To explore companies and apply for jobs visit www.welltodocareers.com. For wellness brands looking to hire — contact us today to get started.